Amotorcycle accident is often the most violent of all motor vehicle collisions. Loss of limb, severe internal damage, psychological stress and brain injury are some of the most common injuries associated with motorcycle accidents. Due to the nature of these injuries, they can have a debilitating affect on the victim’s life, often leading to financial stress. Expensive rehab, inability to work and psychologist bills are just a few of the many costs associated with a severe motorcycle accident. Good motorcycle riders know how potentially dangerous an accident can be for them, and their driving habits and attention on the road reflects this. Unlike those driving in cars, a motorcycle rider is not distracted with the radio, cell phones, passengers, food or coffee. Their focus is on the road and the conditions around them. 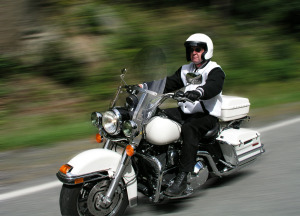 Because motorcyclists are such focused riders, when an accident occurs they are often not at fault. Motorcyclists are frequently victims of not being seen. On Ontario’s extremely busy highways there are constant reminders to check your mirrors and blind spots, but motorcyclists continue to be the victims of inattentive drivers. Tail gating is another major cause of accidents for motorcyclists. Because motorcycles are so light, their stopping distance is unparalleled by any other vehicle on the road. In nearly all cases of rear ending, the rear ender is deemed at fault. Road conditions are another leading cause of motorcycle accidents. Wet roads pose a great threat to a rider, but so do conditions caused by negligence on the behalf of the municipality or region responsible for the road’s upkeep. A pot hole on a highway or loose debris on a corner may go by unnoticed to anyone in a car or truck, but to a motorcyclist these seemingly inconsequential items are potentially catastrophic. If you are involved in a motorcycle accident, it is advisable to contact a lawyer as quickly as possible to ensure you receive a fair financial compensation.